Bookings for the 2014 Candlelight Processional Dining Packages are now available. The dining packages for the Candlelight Processional includes: lunch or dinner at select Epcot restaurants and guaranteed seating to the Candlelight Processional. The 2014 Candlelight Processional is scheduled for November 28 through December 30 this year, and is performed three times each night (5 p.m., 6:45 p.m., and 8:15 p.m.). 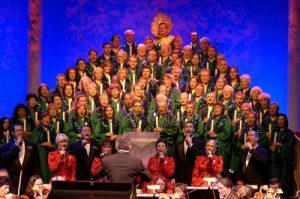 The program includes the telling of the Christmas story by a celebrity narrator who is accompanied by a 50-piece orchestra, and a choir of Disney cast members and special guests. The restaurants participating in this year’s Candlelight Processional dining package are: Biergarten, Chefs de France, Coral Reef, Garden Grill (dinner only), La Hacienda de San Angel (dinner only), Nine Dragons, Restaurant Marrakesh, Rose and Crown, San Angel Inn, Teppan Edo, Tokyo Dining, Tutto Italia, and Via Napoli. For more details on the Candlelight Processional, visit the Disney Food Blog’s Disney World Candlelight Processional Dining Package page. Call (407) WDW-DINE or (407) 939-3463! Booking is also available online. This entry was posted on Monday, July 21st, 2014 at 12:00 pm	and is filed under Dining, Planning, Theme Parks, Touring Plans. You can follow any responses to this entry through the RSS 2.0 feed. You can leave a response, or trackback from your own site.